Watch our new Fluorescent Lights Video! If you accidentally break a light, follow the steps below to make sure that the bulbs are cleaned up safely. Keep in mind that in California fluorescent bulbs and tubes are prohibited from trash disposal. You’ll need to take the broken bulbs to one of the collection centers listed on our Fluorescent Tube or Compact Fluorescent Light (CFL) pages. If clothing or bedding materials come in direct contact with the broken glass or mercury-containing powder from the inside of the bulb, the clothing or bedding should be thrown away because the mercury and glass may stick to the fabric. Do not wash such clothing or bedding because mercury fragments in the clothing may contaminate the machine and/or pollute sewage. You can, however, wash clothing or other materials that have been exposed to the mercury vapor from a broken Compact Fluorescent Light (CFL), such as the clothing you are wearing when you cleaned up the broken CFL. As long as that clothing has not come in into direct contact with the materials from the broken bulb, you should be fine. If shoes come into direct contact with powder from the bulb, wipe them off with a damp paper towel or disposable wet wipes. Place the towels or wipes in a glass jar or plastic bag for disposal. 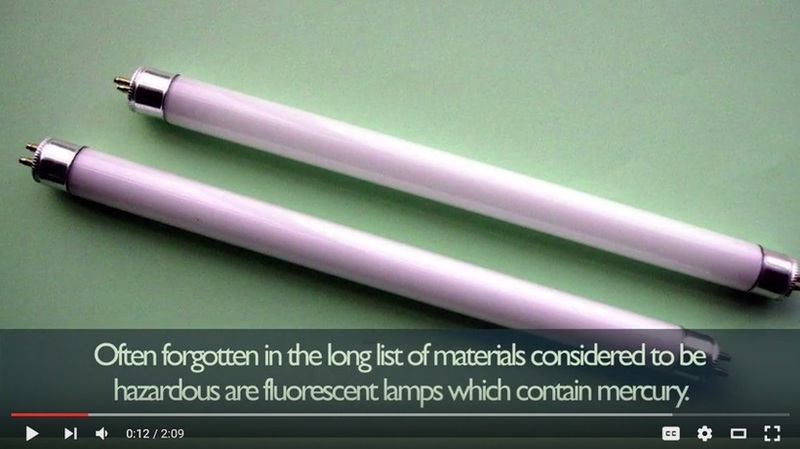 People use other products that contain mercury, not just fluorescent lights. In the event that any of these products break, certain steps need to be taken for safe clean-up and disposal. Check out the US Environmental Protection Agency’s website for more information on storing, transporting, and disposing of mercury.